We would invite you inside for a ride, but even the world's largest diameter tunnel boring machine can only fit so many people. And so we offer the next best thing, Milepost 31, a public information center that will highlight the Alaskan Way Viaduct replacement, tunneling technology and the history of Seattle's Pioneer Square neighborhood. This is a first for WSDOT, an opportunity to explore interactive exhibits about one of our projects and dig into Seattle's first neighborhood. What does viaduct replacement have to do with Pioneer Square? Replacing a highway that runs through one of the state’s most treasured historic neighborhoods comes with challenges. Pioneer Square will see years of construction impacts like noise, dust and traffic detours. Fortunately, after we put the highway traffic into the SR 99 tunnel and tear down the remaining section of the viaduct, the neighborhood will be reconnected with the Seattle waterfront. Milepost 31 was one of several strategies we developed in partnership with neighborhood groups and historic preservationists to maintain Pioneer Square’s vibrancy during construction. 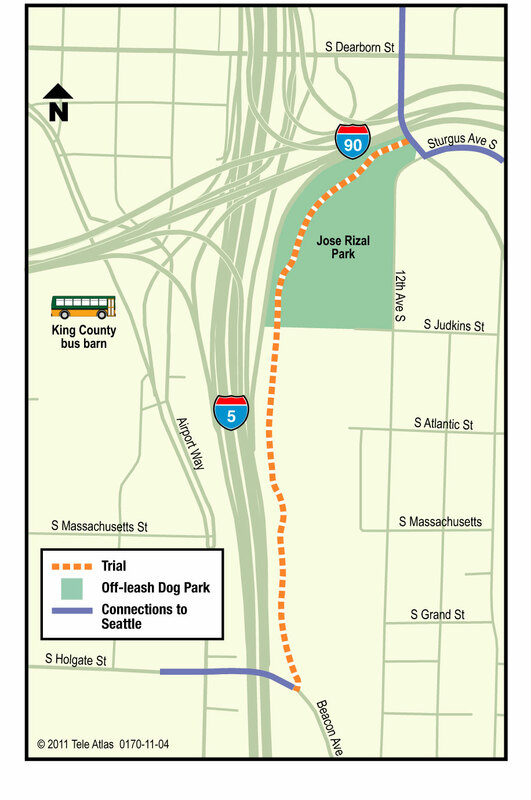 It is designed to give people another reason to visit the neighborhood during construction, while giving the public another opportunity to learn about the important work we do at WSDOT. Be sure to stop by Milepost 31's grand opening celebration on Dec. 1. We’ll have tunneling and historical experts on hand to answer questions, as well as a drawing to win an iPad® and gift certificates to Pioneer Square businesses, furnished by the Alliance for Pioneer Square. After Dec. 1, Milepost 31 will be open Tuesdays through Saturdays from 11 a.m. to 5 p.m. Admission is free. Winter is upon us, not officially, but mother nature has decided it's definitely time to start snowing in the mountain passes. When this snow happens and the weather changes one of the most asked questions we get is "how do I decide if it's safe to drive over the pass" and "which pass should I take?" Here’s what you can do. Take that info, along with help to know how to be prepared to get there and add in the latest conditions to make the wisest choice. Here's a few tips on how to get over the pass and where to find out the latest information on mountain pass conditions. Are your tires properly inflated. Do you have enough gas in the tank, you may end up sitting waiting for other vehicle spinouts to clear or even avalanche control. Have you recently gotten a vehicle winter maintenance check-up for your vehicle? You'd be surprised how many people get stuck because their cars engine or isnt' ready for the journey. Do you have food, water, blankets if you do get stranded and have to wait for an emergency vehicle to come assist you. If you prefer a checklist, the Take Winter By Storm website has some fantastic preparedness checklists. Check any one of the mountain pass pages on our website. If you have an Android or iPhone, download our mobile app by searching "wsdot" in the market place. If you have a blackberry or other web enabled mobile device check out our website for small screens. Sign up to have pass reports delivered to your inbox. Word of warning however, pass reports update every couple of hours so it could end up being a lot of emails. On the other hand, you will be very well informed as to the changing pass conditions. Most importantly, drive for conditions. By planning ahead and taking your time getting over the passes and you should arrive to your destination safely. As the Thanksgiving holiday approaches many people have a lot of things that need to get done. Whether you need to tidy up the house before hosting the big meal or prepare a few dishes to take to dinner elsewhere, there are probably a hundred things on your “to-do” list. Then it shouldn’t be a surprise that the roadways will be equally as busy. AAA forecasts that 38.2 million Americans will be traveling on our nation’s highways for the Thanksgiving holiday, a four percent increase from 2010. With so many people hitting the roads, it is important to remind drivers that as you rush around on errands or prepare to make a long trip to see family, safety should be your #1 priority. Distracted driving is surely one of the major obstacles drivers will face during this busy season. Calling home to find out what’s needed at the grocery store might be important for the Thanksgiving menu, but it’s not so important that the call can’t wait until you’re safely parked in the parking lot. While the vast majority of drivers agree that using a cell phone behind the wheel is a threat to safety, many continue to exhibit a “Do as I say, Not as I do” attitude when it comes to their own behavior while driving. This attitude has to change because no phone call or text is worth the consequences. Another issue drivers need to watch out for is drowsy driving. Many drivers will be taking long trips at odd hours of the day so it is important to watch out for signs of sleep deprivation. Nearly one-third of drivers admit having driven when they had trouble keeping their eyes open and this is even more of a concern after a large Thanksgiving meal. So this Thanksgiving, be sure to put your cell phone down and get plenty of rest before you hit the road. Having the right kind of stuffing at the table is important but the most important ingredient to a successful Thanksgiving is the safe arrival (and departure) of the friends and family you care about. Everything after that is gravy. Happy Thanksgiving from the AAA Foundation Family! Drivers who have experienced close calls or collisions with rocks on the roadway know how frightening and damaging they can be. To reduce the risk of these types of collisions happening on US 12 near White Pass, we worked all summer with the brave slope stabilization crews from Janod Inc. of Dorian, Quebec, Canada. 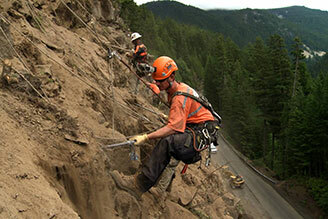 Janod’s crews, hanging from the hillside on ropes, kicked down loose rocks that threatened to fall to the highway. After removing debris (dirt, trees, shrubs and rocks) from several sections of unstable slopes, crews blasted boulders, drilled holes, hauled away about 38,000 tons of rocks and placed protective nets on the steep slopes above US 12, five miles west of White Pass. A total of 900 pounds of explosives were used to blast apart the largest rocks that posed a risk to drivers. After the dust settled and the blast debris was removed, a combination of 52 bolts and dowels were installed to hold the rocks together and to keep them from sliding toward the highway. The final stabilizing work was anchoring the net/fence onto the slopes to contain the rocks that are likely to come loose and fall into the roadside ditch due to erosion. The $4 million project (including design and construction) was completed within budget and a season ahead of schedule. Janod Inc.’s crew will be featured in a National Geographic Channel series called “Rock Stars”. The first episode airs at 10 p.m. on Tuesday, Nov. 22. WSDOT prioritizes the treatment of unstable rock or soil slopes on a statewide basis, using an engineering analysis to compare the cost to the potential benefit. This year’s $4 million project is one of a series of unstable slope projects on a 25-mile corridor on US 12 near White Pass. Work in the corridor started in 2006 and is scheduled to be completed in 2013. How do you curb collisions on a busy highway? With curbing – if you’ll pardon the pun. 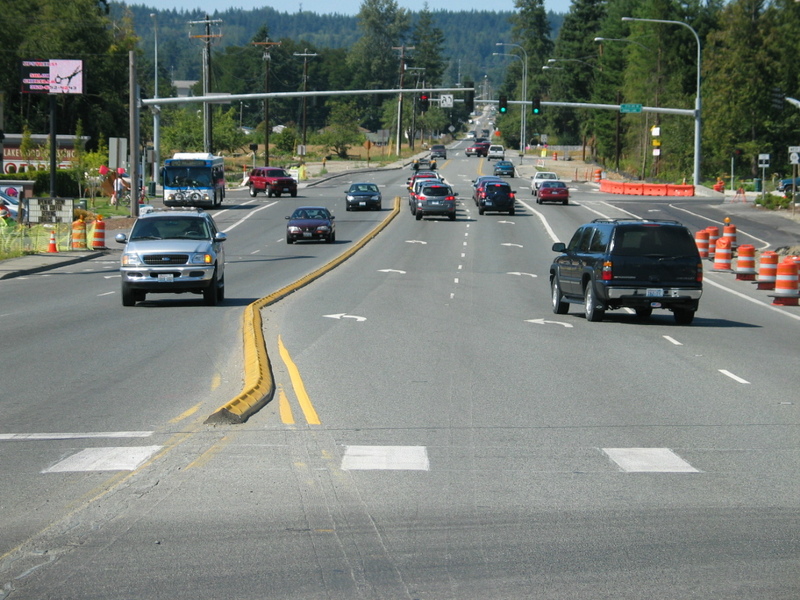 In the five years since we installed curbing along the center of SR 531 in Arlington, turning and driveway-related collisions have dropped by 70 percent. We’re not trying to pat ourselves on the back or anything, but we think that’s a pretty sweet deal – and not just for us. Anyone who drives that road on a daily basis is benefiting from a safer, less congested commute. We installed the curbs between I-5 and just past Smokey Point Boulevard in the fall of 2006 as part of two separate projects. 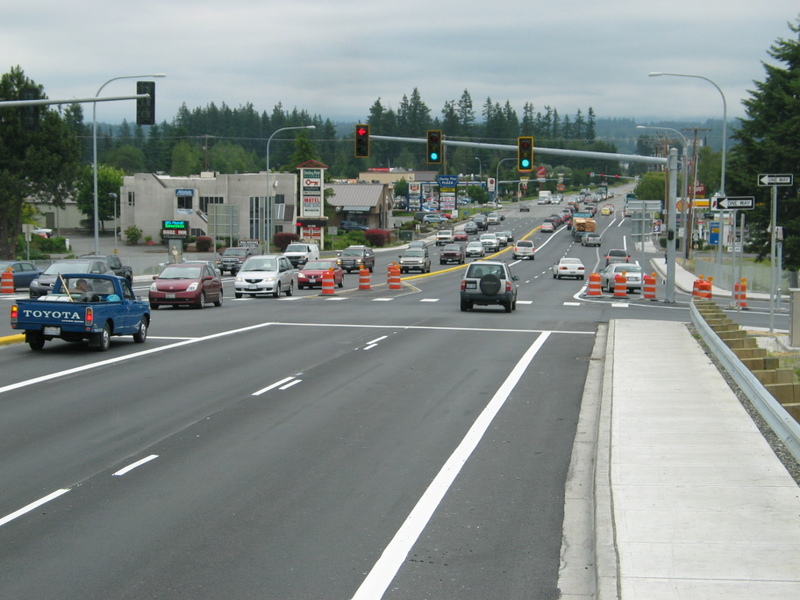 Like a lot of construction projects, our ultimate goal was to improve traffic flow on SR 531 and reduce the risk of collisions. 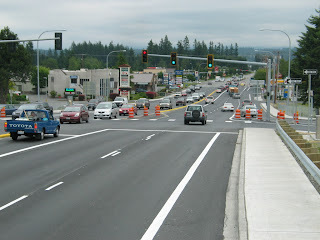 The first project wrapped up in July 2006, and ultimately widened the SR 531 bridge over I-5 to six lanes. As part of that project, crews installed curbing down the center of the bridge to separate east and westbound traffic. The second project wrapped up a few months later, in September 2006. 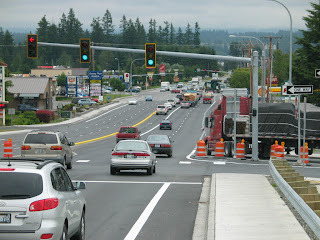 During that project, we added dedicated left-turn lanes, built bus pull-out locations and u-turn locations, and added curbing along the center of the highway, all the way from I-5 to just east of Smokey Point Boulevard. It’s probably easy to see how a new, wider bridge could improve traffic flow. More lanes means more traffic getting through the area. But what about curbing? How does a little bit of concrete curb make such a big difference in reducing congestion and collisions? By limiting the number of places where drivers can turn across traffic, other drivers can better anticipate – and react to – turning traffic. More reaction time typically translates to fewer collisions. And dedicated turn pockets and u-turn locations give turning drivers a safe place to wait for a gap in traffic without backing up other drivers who aren’t turning. Fewer collisions? No waiting in line behind a driver turning left? Those are two big factors that help traffic flow better. 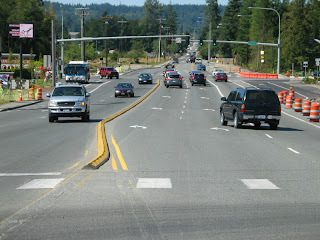 On SR 531, the curbing has paid off in a big way. In the three years before the curbing was installed, there were 95 driveway or turning-related collisions. In the three years after the curbing was installed, those collisions dropped by 70 percent, to only 27. Not only that, but the total number of collisions on SR 531 between I-5 and Smokey Point Boulevard dropped by 27 percent after curbing was installed. It’s nice to know that even a small piece of construction can make a big difference. It was a case of “out with the old and in with the new” over the scenic Port Washington Narrows on Nov. 10. 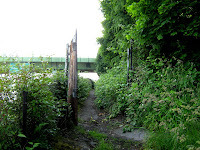 The old: a rusted, worn down, 81-year-old bridge that lacked shoulders and, due to structural deficiencies, had weight restrictions imposed on it in 2008. The new: a wider, safer bridge that features, two 11-foot-wide lanes, two 5-foot-wide shoulders, and a 10-foot-wide pedestrian walkway. Federal, state and city officials joined hundreds of local residents to mark the opening of the new Manette Bridge – reminiscing fondly about the past and looking forward to the future. The celebration brought everyone from representatives from the Armed Forces to the Bremerton High School Marching Band. It also brought the festive air of music, song and cheers. 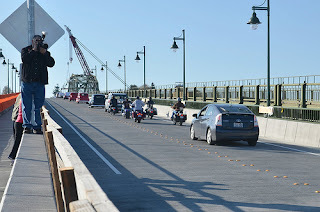 The celebration continued on with honking horns as the first cars made their way across the bridge. 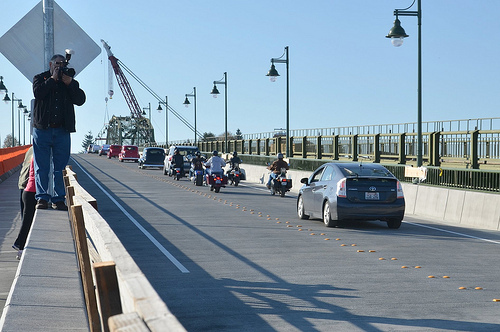 The $60.6 million Manette Bridge Replacement Project not only results in a more driver-, pedestrian-, and bicyclist-friendly structure, but it also adds a new roundabout in Manette that will keep traffic flowing for years to come. Crews from Manson-Mowat, the contractor that built the bridge, are still hard at work on site, expanding the nearby Whitey Domstad Viewscape that overlooks the Port Washington Narrows. Manson-Mowat is gearing up to tear down the old Manette Bridge, a hefty task in itself that is scheduled to wrap up in February 2012. The old bridge’s in-water concrete supports will be demolished later in 2012, marking the end of a structure that eight decades ago brought east and west together across the narrows, and provided direct access for Manette and Bremerton residents that didn’t require a boat. Among those who were first to cross the new bridge were a handful of people who had also crossed the original bridge in 1931. Now how many people can claim to have been on hand to open the same bridge twice? Truly, Nov. 10 was a great day for many, and a uniquely historical day for a few. Find out more about the event and check out photos of the celebration. For Seattlelites, thinking about the “jungle” might bring to mind homelessness, drugs, violence and crime. 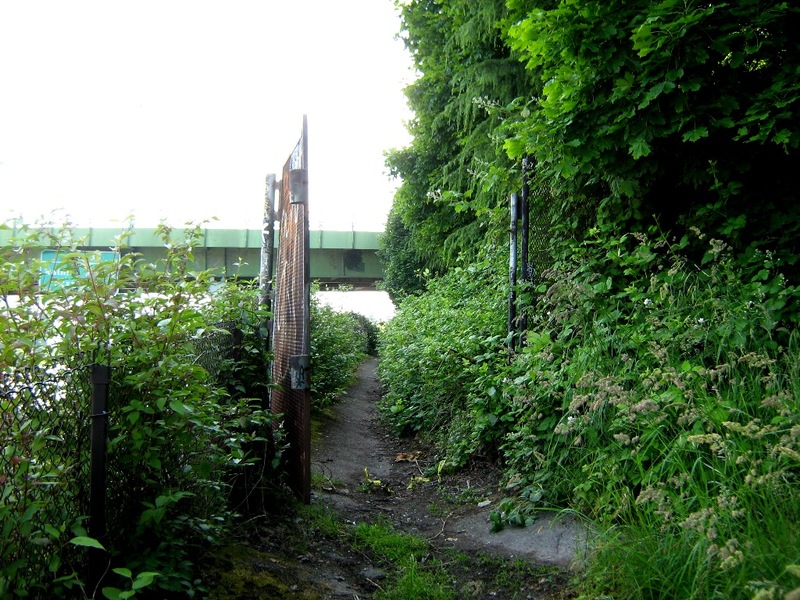 Until recently, a stretch of urban forest along I-5 and I-90 on Beacon Hill dubbed “the jungle” was a community eyesore begging for a transformation. 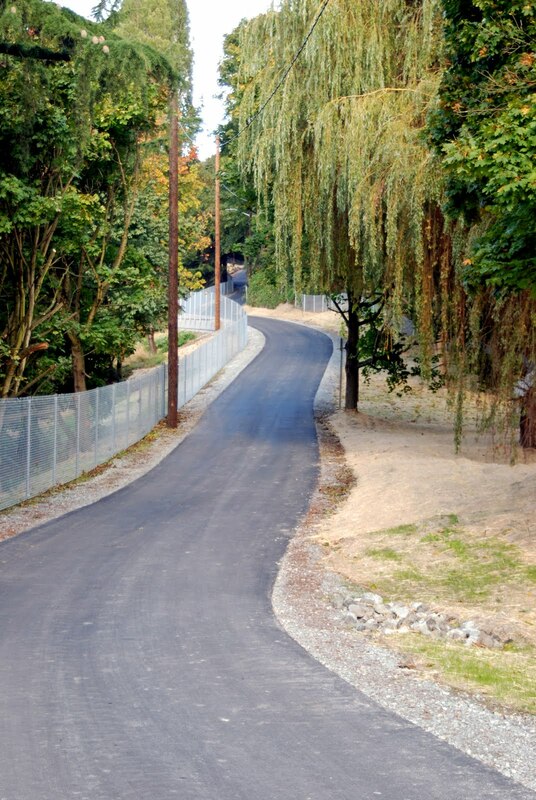 Hopefully that negative image can be replaced with a positive one now that a multi-use trail and park has been carved out of the hillside known as the East Duwamish Greenbelt. The new section of the Mountains to Sound trail is nearly a mile of paved, level surface great for walking, biking and running. 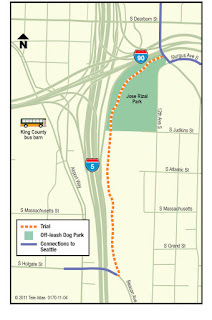 Bring your dog(s) as there is also an off-leash park adjacent to the trail. Huge street lights line the path from beginning to end for night use and safety. Connections between Beacon Hill and downtown Seattle and the International District are available via 12th Avenue South, and to the SODO district, sports stadiums, and the waterfront via South Holgate Street. 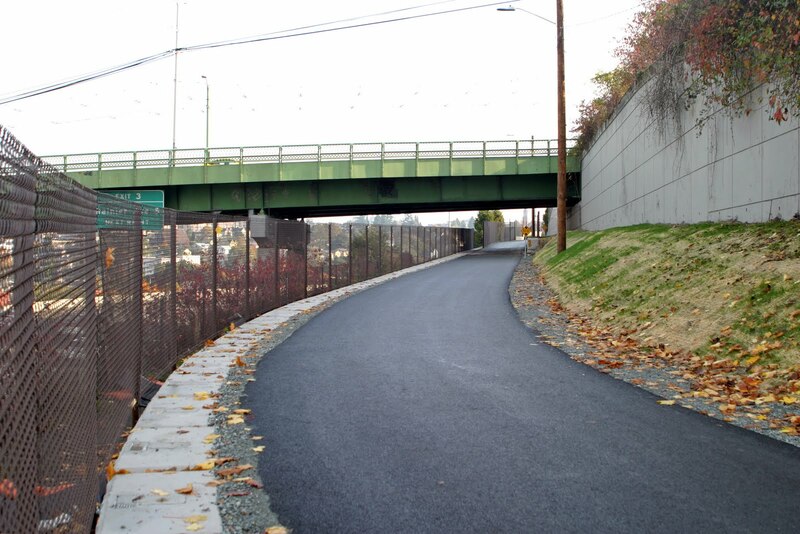 Even if you’re not from Beacon Hill, this new trail deserves a visit. 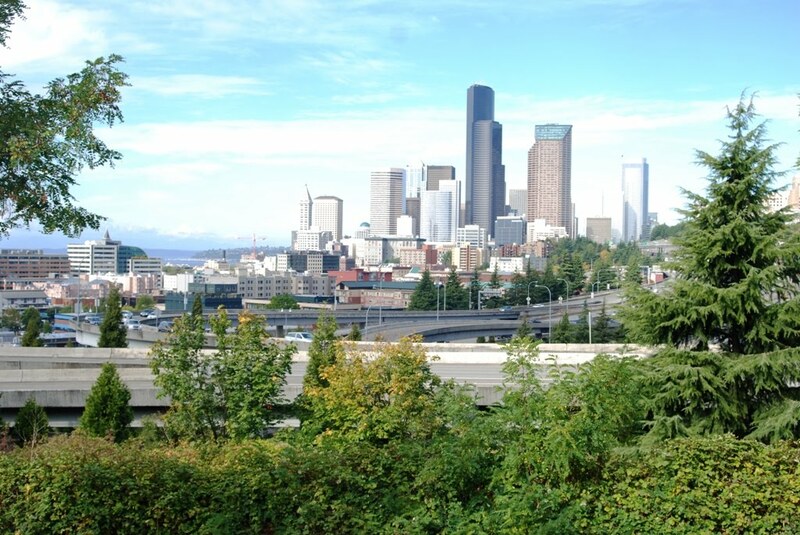 It is a great place to take a stroll with some of the most breathtaking views of Seattle. It parallels I-5 and eastbound I-90 so you can get a 180-degree view of the Seattle skyline, downtown, the stadiums and even the waterfront. On a clear day (and even not so clear days) it is just amazing! Judging by the photo above, you could even create your own postcard! More photos available at our Flickr page. The Mountains to Sound Trail is part of the larger Mountains to Sound Greenway effort that has helped create 100 miles of trail along I-90 from Central Washington to Seattle, focusing on preserving open spaces and wildlife habitat. 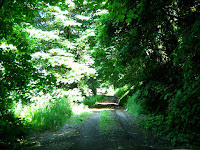 We worked with the Seattle Department of Transportation (SDOT) to build the trail beginning in June. 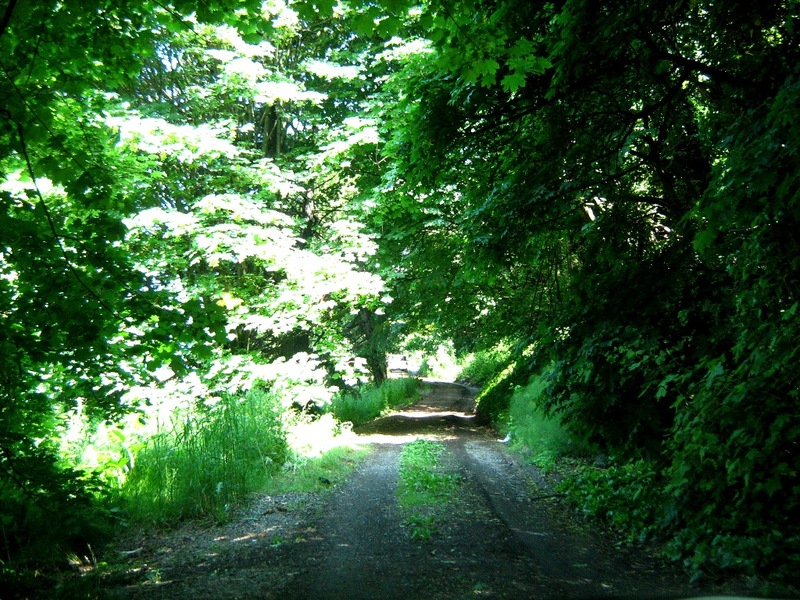 The trail is built on mostly state right-of-way. and was completed at the end of October. On Saturday, Oct. 29, we hosted a ribbon-cutting event in partnership with SDOT, the Mayor’s office, Seattle Parks & Recreation, and various community groups that supported the project. A large number of folks from the community attended the ribbon cutting event, which showed the immense support for this project. It was a beautiful sunny day and really showcased the transformation of this area and the potential for expanded use. Lots of people hit the trail for the first time including Mayor McGinn and Deputy Mayor Smith, as well as a couple of officers from the Seattle Police Department Bike Patrol. We are proud to be a part of this project as it will make a difference in an area that needed a major boost. The Mountains to Sound trail will hopefully provide the breakthrough needed to help this area become a community asset. A recent AAA Foundation study again calls attention to the ‘Do as I Say, Not as I Do’ attitude that exists in this country when getting behind the wheel. In this instance, we’re referring to drowsy driving, which kills, just as sure as drunk, drugged and distracted driving does. A study we released last year showed one of every six deadly crashes and one in eight crashes causing serious injury involved a drowsy driver. Now, according to the Foundation’s 2011 Safety Culture Survey, two out of every five drivers (41%) admit to having fallen asleep at the wheel at some point, with one in 10 saying they had done so in the past year. Yet, nearly all of these same drivers (96%) feel drowsy driving is an unacceptable behavior and almost a third (32%) admitted driving when they were so tired that they had difficulty keeping their eyes open in the past month. Drivers have a tendency to underestimate the impact being tired has on their driving ability, which puts themselves and others at risk. To help raise awareness among all drivers of the seriousness of this deadly, yet far too common driving practice, AAA and the AAA Foundation applaud the National Sleep Foundation’s annual Drowsy Driving Prevention Week®. Most people have experienced the feeling of sleepiness while driving, and many try to power through or dismiss key warning signs that signal their minds and bodies need a break from driving. Please read and pass along the following safety tips and help us continue our conversation on how to change traffic safety culture in this country. Boulevard project in Union Gap. Completion of new ramps and the third and final roundabout at the Valley Mall Boulevard/ Interstate 82 interchange marks the end of construction on a project that already has improved traffic flow and reduced collisions in Union Gap. On Monday, Oct. 31, local, state and federal officials joined the Washington State Department of Transportation in celebrating the interchange improvements with a ribbon-cutting ceremony. The $34 million, 18-month reconstruction project included installation of three large roundabouts, two new interstate bridges built higher for better clearance and wider for future expansion, and new on-ramps and off-ramps that allow traffic to access the interstate without waiting at stop signs or traffic signals. "These improvements relieved traffic congestion at the busiest intersection in Union Gap, opened access to businesses and kept 140 men and women working, " said state Transportation Secretary Paula Hammond. "Investments like this one help the economic vitality of the area and provide family wage jobs - important benefits at this time in our recovering economy." Since the first two new roundabouts opened in November of last year, traffic flow has improved and traffic data shows that collisions in the area have been cut in half. Some 22,000 vehicles use the Valley Mall Boulevard interchange each day and, prior to the reconstruction, occasionally backed up onto I-82. 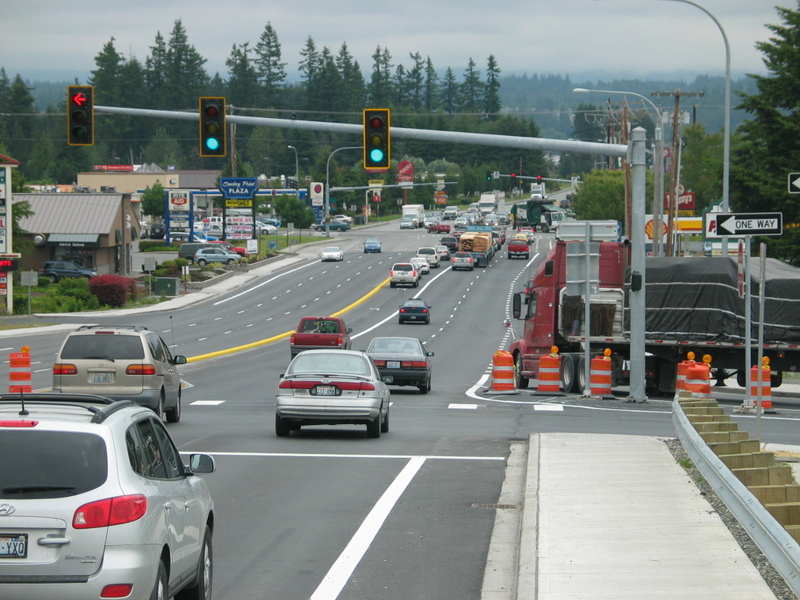 "Prior to reconstruction I can remember waiting for several minutes in long lines to get through the signalized intersections," said Don Whitehouse, WSDOT regional administrator. "Now the longest I've waited to get through the new roundabouts is about 10 seconds." Apollo Inc. of Kennewick was the general contractor on the project, which was the largest project funded in Yakima County by federal American Recovery and Reinvestment Act money. Funding also came from the state's 2005 Transportation Partnership gas-tax increase. The project was completed on time and half a million dollars under budget. The growing chill in the air, the rustling of leaves under our feet, and the holidays just around the corner all signal that it’s time to turn back our clocks. As we prepare to fall back an hour this weekend courtesy Daylight Savings Time it can be easy to discount the potential dangers that come with fewer hours of daylight to complete everyday tasks. The sun rising later and setting earlier means that morning and evening activities, like a daily run, walking the dog, commuting to and from work, and walking or biking to school might now be done under the cloak of darkness with diminished visibility for all involved. Colder temperatures also cause people to brace against the elements by using jacket hoods to keep warm and drivers often begin driving with frosty windshields (even though they shouldn’t). Both of these things restrict vision and make it considerably less likely for drivers, pedestrians and cyclists to be aware of one another. - Leave headlights on an hour after dawn and turn them on an hour before dusk. - Avoid grogginess behind the wheel on dark mornings by allowing for sufficient prep time to fully wake up. - Keep to sidewalks and crosswalks. - Wear bright or reflective clothing, dark clothing in dark light make you difficult to spot. - Slow down and stay alert when driving on residential streets and in school zones during early morning and afternoon hours. - Ride on the side of the road (or bike lane if available) and ALWAYS obey traffic signals. - Like walkers, dress to be seen and be sure you have reflectors and/or lights to make you more visible. - Use caution when driving through piles of leaves, which can hide dangerous debris and become slippery when wet. - Fall storms means down tree limbs and branches, be mindful of them blowing into the road. This week, tens of thousands of drivers a day are using a brand new section of State Route 99 in Seattle’s SODO neighborhood. After slogging through the not-quite nine day closure (it turned out to be about seven-and-a-half days) of the Alaskan Way Viaduct last week, drivers are now rolling across a new bridge over South Atlantic Street. This is the first of two side-by-side bridges that will make up the new highway near Seattle’s port and stadiums. The new bridge is temporarily connected to the viaduct along the downtown waterfront through what we’re affectionately calling the “SR 99 construction bypass road.” Okay, it’s not really affection so much as an accurate description of how we are able to keep SR 99 open through construction of the viaduct replacement. We want to thank everyone who carpooled, bused, took the water taxi, or adjusted their work schedule for helping to keep Seattle traffic moving while SR 99 was closed. 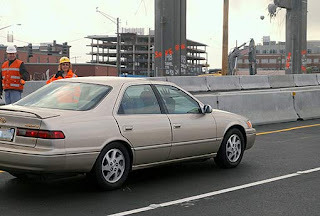 The photo above this story shows Skanska Project Engineer Tim O’Neill and WSDOT Assistant Project Engineer Diane Berge waving to the driver and passenger in the first car to cross the new SR 99 bridge just before 1 p.m. on Saturday, Oct. 29. The new bridge currently accommodates two lanes of both north- and southbound traffic, while crews finish demolishing the southern portion of the viaduct and begin building the second bridge. The construction bypass road, with its 25 mile per hour speed limit, will be in place until the SR 99 tunnel opens in late 2015. During the last week, you probably saw a few pictures or videos of demolition in the media. We must admit that demolition is really cool to watch. We tried not to go overboard with our own photos, so we put the best of our best images on our Flickr site. Demolition isn’t over, so we’re regularly updating our demolition set with new photos. As demolition got under way, we wanted to be sure that you and anyone else had a chance at an up close and personal goodbye to the viaduct. Despite constant rain on Saturday morning, Oct. 22, more than 3,200 people obliged by walking up to the top deck of the viaduct to take pictures, check out the view and even hula-hoop. Demolition and the first car on the new section of SR 99 are all now part of history. If you’re interested in seeing more viaduct history, we recommend you peruse our ViaductHistory.org website.